​Manchester City legend Bert Trautmann has been immortalised on film in the biopic 'The Keeper', telling the awesome and inspiring story of his life, from German prisoner of war to English football icon, and released in select UK cinemas today (5 April). Trautmann, who sadly passed away in 2013 aged 89, is portrayed by David Kross, with the actor describing his character as a 'very modest and polite man' as well as 'fearless and ambitious'. Life for Trautmann, born Bernhard, began in 1923 in the industrial German city of Bremen. He excelled at sport from a young age, notably football and handball, and would join the organisation that eventually became known as Hitler Youth in 1933, aged 10. As a teenager, he joined the German armed forces in 1941 and trained as a paratrooper. With the Second World War already raging, Trautmann was first posted to Poland and, following a three-month prison sentence over a practical joke gone wrong, later Ukraine. The Eastern Front was brutal and Trautmann's unit was badly hit. It was during this time that he was awarded the Iron Cross, one of several military medals he received. There are stories that he was captured by Soviet and French forces, escaping both times. He is also said to have evaded capture by an American soldier, only to immediately come across a British soldier instead. Legend has it, 'Hello, Fritz, fancy a cup of tea?' were the words that greeted him. That third capture was Trautmann's last. He was imprisoned by the British in Belgium and was later transferred to Essex, before reaching a prisoner of war camp in Cheshire, north west England. Initially, his captors regarded Trautmann as a 'category C' prisoner, a Nazi. This was the result of his Hitler Youth past and associated indoctrination from a young age, plus the fact he had joined the Nazi war effort as a volunteer. Eventually seen as less of a threat, he was downgraded to 'B', prompting a move to a POW camp near Liverpool, and later a final one in Lancashire. It was while staying in these two camps that Trautmann began working and mixing with local people, many of whom were suspicious of a former German soldier, even though the war was over. He also continued playing football and went on to join amateur side St. Helens in 1948, having rejected the offer of repatriation to Germany in order to continue his new life in England. A chance to join Manchester City arose in 1949, although still Trautmann had to deal with prejudice and scepticism from as a German living in England at that time. There were threats from City supporters to boycott the club, as well as protests and disgust from further afield. But Trautmann rose above it. He continued to do what he was good at and received a standing ovation from fans in London during one particular game against Fulham in 1950, his first visit to the capital, and a game where abuse had been particularly strong until his quality in goal shone through. After five-and-a-half seasons of standout performances, during which he barely missed a game, Trautmann, who was known for his shot stopping and ability to distribute the ball to teammates by throwing it, became the first German to play in the FA Cup final in 1955 as City faced Newcastle at Wembley. Losing a player to injury in the days before substitutes, City lost 3-1. 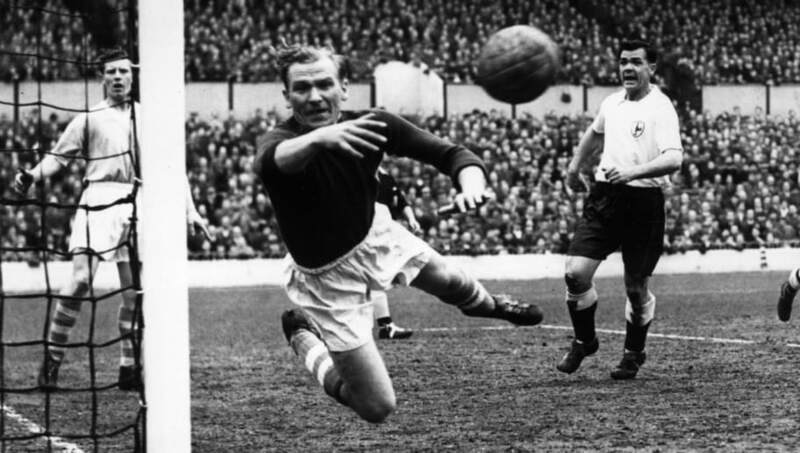 However, Trautmann returned to the FA Cup final a year later in 1956, the game for which he has become most remembered and secured his legendary status in the annals of English sport. Two days prior to the cup final, this time against Birmingham, Trautmann was voted FWA Footballer of the Year award by English journalists. Not only was he the first goalkeeper to win, he was the only non-British or Irish player until Dutchman Frans Thijsen in 1981. Bouncing back from defeat in 1955, City won the final 3-1. But, unbeknownst at the time, Trautmann played the last 15 minutes of the game with a broken neck after a collision with Birmingham forward Peter Murphy. He was dazed and in pain, but rather than leave his team short, the goalkeeper continued, even making crucial late saves to preserve City's lead. It was not until three days later, having attended the winners' banquet unable to move his head and been turned away by one hospital on the assumption it was nothing serious and would soon subside, that Trautmann learned how close to death he had been. An X-ray back home in Manchester revealed that the collision had dislocated five vertebrae in his neck, cracking one. It was only because one of the loose bones had wedged itself against another, preventing even further damage, that the injury wasn't fatal. Trautmann eventually returned to action midway through the following season. Although no longer at his former best, he was back to playing virtually every game for City by the 1958/59 season and continued to do so until 1962. By this point, Trautmann was 38 years of age, and he eventually retired in 1964, playing just two further games at non-league level. Off the field, Trautmann had married Margaret in 1950. They met in St Helens as he transitioned from prisoner of war to footballer and their relationship is a central theme in 'The Keeper'. The couple had three children, one of whom, John, died in a car crash aged just five in 1956 while Trautmann was recovering from his broken neck. He and Margaret were to divorce in 1972, with Bert later stating that his wife's painful struggle to deal with the heartbreaking loss of their son contributed to the breakdown of the marriage. Once the enemy, a pariah who was heckled and feared, Trautmann was inducted in to the English Football Hall of Fame in 2005. If you can, go and watch 'The Keeper'.